Over the past several decades, the public and private sectors made significant investments in global health, leading to meaningful changes for many of the world's poor. These investments and the resulting progress are often concentrated in vertical health programs, such as child and maternal health, malaria, and HIV, where donors may have a strategic interest. Frequently, partnerships between donors and other stakeholders can coalesce on a specific topical area of expertise and interest. However, to sustain these successes and continue progress, there is a growing recognition of the need to strengthen health systems more broadly and build functional administrative and technical infrastructure that can support health services for all, improve the health of populations, increase the purchasing and earning power of consumers and workers, and advance global security. 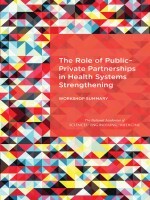 In June 2015, the National Academies of Sciences, Engineering, and Medicine held a workshop on the role of public-private partnerships (PPPs) in health systems strengthening. Participants examined a range of incentives, innovations, and opportunities for relevant sectors and stakeholders in strengthening health systems through partnerships; to explore lessons learned from pervious and ongoing efforts with the goal of illuminating how to improve performance and outcomes going forward; and to discuss measuring the value and outcomes of investments and documenting success in partnerships focused on health systems strengthening. This report summarizes the presentations and discussions from the workshop.